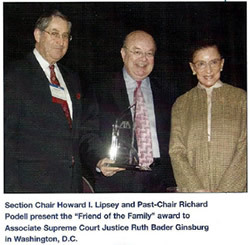 Richard J. Podell graduated from Colgate university (A.B. 1966) and the University of Wisconsin (J.D. 1969). He is the President of Podell & Book, S.C., where he practices in the area of Family Law. Mr. Podell is a former Chair of the Family Law Section of the Milwaukee Bar, State Bar of Wisconsin and the ABA, as well as the Wisconsin Chapter of the American Academy of Matrimonial Lawyers. In addition to being a certified mediator in Family Law by the American Academy of Matrimonial Lawyers. Richard J. Podell is a fellow in the American Academy of Matrimonial Lawyers, the Wisconsin Law Foundation and the American Bar Foundation. 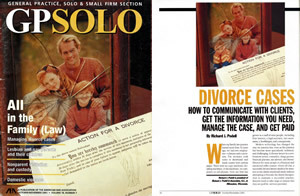 He has written articles for industry publications such as GPSOLO, a publication of the American Bar Association (shown left). Mr. Podell has appeared in other well-respected industry publications such as The National Judicial College, Family Advocate, The Solicitors Family Law Association and attended the Faculty of Advocates conference with Bar Leaders from around the world. 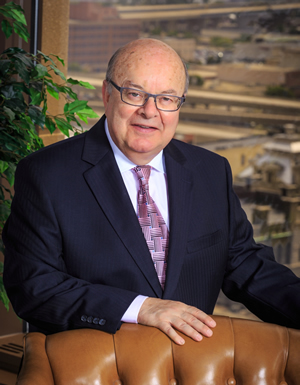 A former member of the American Bar Board of Governors and former Wisconsin State Delegate to the American Bar Association, Mr. Podell has also participated in joint efforts between the Canadian Bar and the American Bar Family Law Sections. Mr. Podell’s wife, Penny E. Podell, is a former County Supervisor who served Milwaukee County for over 25 years. They are parents to a son, Attorney Todd Podell who lives with his family in Texas and daughter, Tasha Tilock, who lives with her family in Virginia. The Podells enjoy spending time with their 5 grandchildren. Call our office at (414) 224-6060 or send us your request online. © 2017 Law Offices of Richard J. Podell All Rights Reserved. Mequon, New Berlin, Brookfield, Oconomowoc, Waukesha, Elm Grove and beyond.